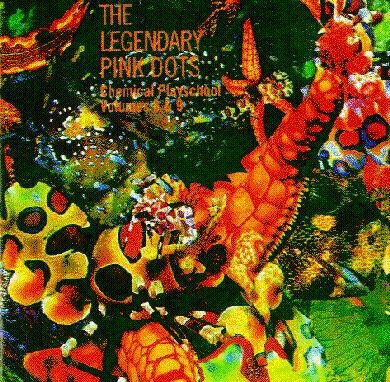 The Legendary Pink Dots, "Chemical Playschool Volumes 8 & 9"
An anthology release of rarities, compilation appearances, and unreleased material. Several of the previously released tracks (such as "Andromeda Suite", "Burned At The Steakhouse", and "Where No Man") were slightly remixed for this release. Floored by the tripwire. Stripped by the crossfire. Down on my knees. For the first time in years, I believed... And you came and you threw me your hand and we swam to a land where a promise was sacred, preserved. And my lady is whispers. my lady is air. I keep a strand of her hair in a heart on my breast... and I'm safe in our warm cocoon. I know you'll be back soon and that's a promise that's sacred, preserved. colour me rainbows. Colour me vexed. I'm perplexed by that light from your moon. But you said you'd be back soon and that's a promise that's sacred, preserved. Catch a match. A bang bang. A flashing fist O' crackerjack. A smack. A lick. A char char. You're all burned out. Just a cry or a whisper in the artificial silence could have helped us to find our island and build a home made just for two. But your pride and my resistance and the strong advice of those who wish us well maintained the distance - and I doubt I'll ever see you again. Yet I wonder if you wrote me...? I wonder if I called...? Would we hide behind the wall that divides us and protects us from all that fall back into violence. Can we crack this silence? Don't be scared, he's only shouting. Five lives down, but then, who's counting? I have a box to keep my doubts in. I keep them to myself. I'm quite humane. I'd never test you. The things inside me would depress you. Lock them up, you know it's best I keep things to myself. Take this cup, dissolve with me. Tonight's a one way voyage through your mind where all the doors open wide, where everything's exposed... Kill all fear. Take this and sign along the dotted line. Free yourself. No possessions! Imagine there's no heaven. Tell me doctor, what exactly is the problem? Do I not behave according to the patterns on your wall? Do I push all your parameters, am I unfit for your box? Tell me doc... do you have the perfect cure? Will you shower me with red ones, green ones and yellow ones? Is the answer in a spike, or with a rusty knife or in that place they call "heaven"? Ah... there's no need to send me flowers for I have gardens where I go walking with my wife. Though I haven't met her yet, I know she's coming because she sends me messages... lots of messages. It's along way to Andromeda but we'll marry in the spring. Turn. Turn. Run the risk. The world spins for you. In five years none of this will mean one thing. If all seems lost and they're out to floor you - turn and face the day. And once I trapped a golden moment. It felt so good, I pulled the reins. But you turned to stone and the joy was frozen. I had to let the moment slip away. Now I confess that I'm king of nowhere. I confess I'm no master of my soul, but like a river I shall flow where I'm told. Jesus walked the earth again. He stretched his hand to kill our pain. The spring winds blew... the acid rained. Love rained for fifteen hours. Generals gazed from Lover's Leap then took a step for earthly peace - just flew to pieces, literally... Of course, we brought them flowers. But nothing stops the great machine, the wheel spins round, the tannoy screams "Get back in borders! Orders! Orders! Redefine your lines!" And Satan walked the earth again, brought plagues of locusts, whips and chains... Played Guns 'n' Roses, blocked the drains but no one payed attention. Too busy in their quiet dream, playing possum drinking tea. The world concluded happily. So there.